Check out <a href=”http://podcast.intego.com/79”>the latest episode of The Intego Mac Podcast, which I co-host with Josh Long. We talk about Macs and iOS devices, and how to keep them secure. 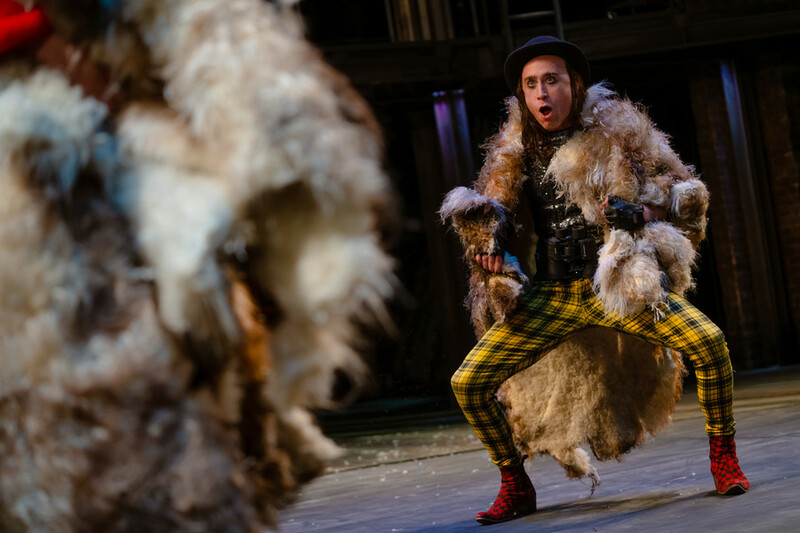 As You Like It is certainly a crowd-pleaser, and it’s one of the plays that gets produced fairly often. I think the fact that the RSC is doing it so soon after its last production is mostly to do with the fact that the RSC is currently in a process of putting on all of the plays in a six-year period (though I think that may have slipped to eight years), and because they started filming their plays and broadcasting them to cinemas only at the end of 2013 with Richard II. So this production will eventually be part of the box set of all the plays on DVD and Blu-Ray. This year’s production has a lot going for it, but will not please everyone. It’s quite minimalist; there are essentially no sets (though there is a thing that happens at the end). It opens with Orlando (David Ajao) sitting an a swing suspended from the rafters, above a circle of faux grass. The first half hour – the bit where he wrestles, meets Rosalind, and they both get banished – takes place with that grass on stage. When the action moves to Arden Forest, the grass is removed, the house lights come on, and there are announcements over some speakers at the back of the stage. I believe they say “All the actors to the stage,” which is followed by a few more announcements, then “All the world’s a stage,” referring to the famous speech by Jacques that comes in later. The back of the stage lifts up, and you can see the backstage area; the undecorated bit, the brick walls, the ropes tied to the walls; what the actors see when they’re behind the decor. At the same time, most of the actors come out on stage and some clothes rails are rolled out with costumes. Some of the actors change their costumes, they all mill about, then the costumes are wheeled off and they pick up the play. Photos by Topher McGrillis (c) RSC. The first time I saw the play, I really didn’t get this, but the second time I think I understood what the director, Kimberly Sykes, intended. This is a literal interpretation of “All the world’s a stage,” with the actors showing that they are, indeed, actors, a sort of meta fourth-wall approach to the play. From this moment on, the lighting changes a bit until the end of the play, but the audience is part of the raw theatrical experience, and is almost always illuminated. Since there are no sets, there are no trees anywhere to be seen. This is a forest, and trees are important in the play. It is either the vertical beams in the theater that are supposed to be the trees, or the audience itself, made up of hundreds of trees. (My suspicion is that it’s the latter, as Orlando pastes a few post-its with notes about Rosalind on different audience members.) All this means that the director’s vision isn’t entirely clear, and this may contribute to the many reviews that were ambivalent about the production. In any case, looking at it through this point of view, it’s a charming, fast-paced studio play. 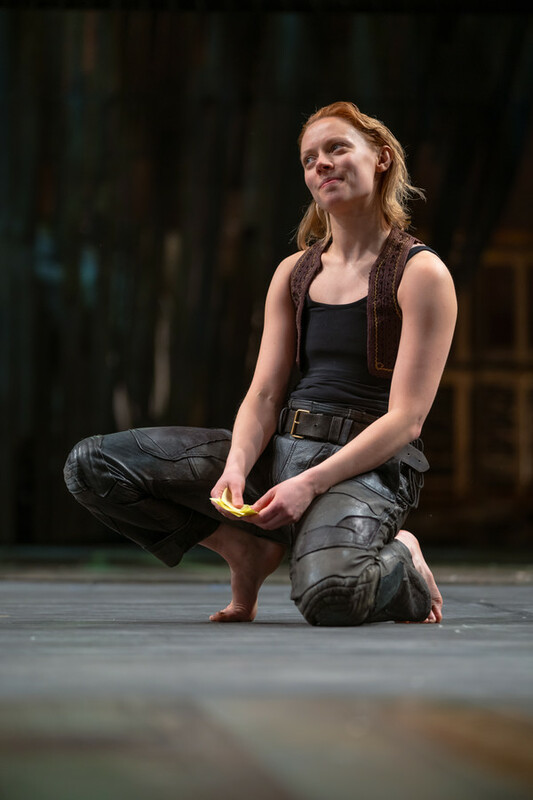 The lack of sets makes it seem more improvised, and the fantastic Lucy Phelps is radiant as Rosalind, carrying the play throughout (Rosalind has about 20% of the lines in the play). There’s lots of audience interaction – see this article, about when I got on stage during one performance – and there’s lots of laughter and fun throughout. Sandy Grierson as Touchstone was marvelous, clowning around to keep the action moving, and Rosalind hops into the audience a few times. Anthony Byrne plays both dukes – Duke Frederick in court, and Duke Senior in the forest – and is wonderful in both roles, the former being powerful and angry, the latter being open and friendly. Another quirk in this production is the 50-50 gender splint, which means that Jacques is a woman (Sophie Stanton), and Silvius is Sylvia (Amelia Donkor). This latter change alters some of the text, as Phoebe is in love with a shepherdess instead of a shepherd. I don’t think the Jacques was melancholy enough, but it was interesting to hear Stanton recite the famous “seven ages” speech. Hats off to the many minor characters who gave their all, notably Charlotte Arrowsmith, a deaf actor, as Audrey, whose signs were interpreted by Tom Dawze as William. Oh, and there’s that bit at the end with the massive puppet as Hymen, the god of love, giving benediction to the marriages. It’s the only large item on stage for the entire performance, and it is quite jarring. It’s imposing, and it’s really not necessary. I really don’t see why the director chose to close the play with something like this. Having seen this production twice, I look forward to seeing it again before the run ends in August. If you can make sense of the staging, it’s lots of fun. The time went be very quickly, with never a dull moment. There were songs, lots of laughter, some tears; all in all, exactly what the world is like. Last week, Dave Mark posted an article about Apple Maps and the air quality index on The Loop. I had chatted with Dave before he had published this, pointing out that the system used in the UK is different from that in the US. In the US, the scale used goes from 1 – 500, and the UK uses a scale from 1-10. 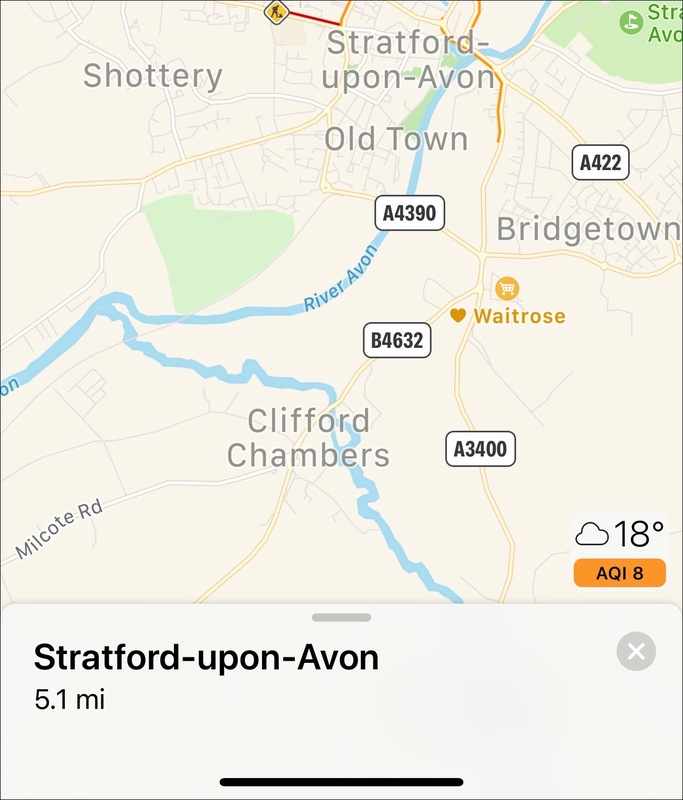 Here in the UK, I do see the current AQI on Apple Maps, with the appropriate number, and a color that gives a visual idea of where it is on the scale. As you can see here, the AQI is quite poor, because there is very high pollen (death to rapeseed! ), and Maps shows that with an orange background. My Apple Watch, however, gives different information. It shows that the AQI is indeed 8, but if you look at the AQI complication, you can see that the little dot is down at the green end of the scale. When I tap the complication, it says that the AQI is Good, which is clearly wrong. It seems that, while the weather app on the Apple Watch is getting the right number, it’s not using the appropriate scale. It thinks that this is the US scale, so no matter what the AQI is in the UK, this will show as Good, because it’s matching it to a scale that goes up to 500. This is a minor problem of localization: the Apple Watch knows where I am, and should provide the correct information. But it’s a pretty dumb one, that is easy to fix. 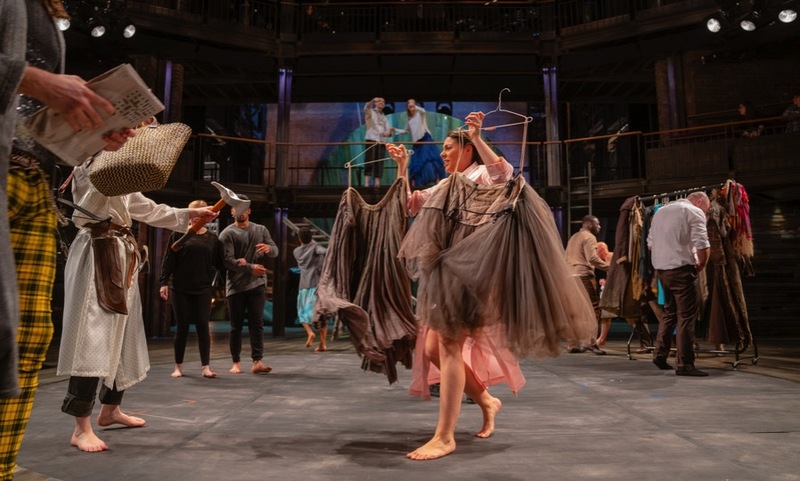 Last Tuesday, I had a very interesting experience, playing a small but important part in a performance of the Royal Shakespeare Company’s current production of As You Like It. For a brief moment, I was onstage holding two pieces of paper, bearing the letters I and N, as Orlando had four audience members hold up sheets of paper spelling out the name of his love, Rosalind. But there’s a lot more to it than that. I attended a very special performance of the play; one that was intimate, nearly a command performance, for an audience of just seven people.